I have talked on a previous post about how much I love the chicken nuggets from this same brand. 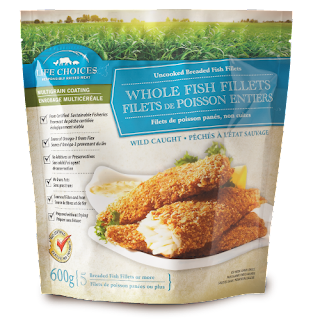 These fish fillets are no different! They taste miles away from the fish fingers I used to eat as a kid. I think the key is that they are made from wild caught fish, as opposed to "fish meat" (or some other mega-processed fish ingredient). The breading is similar (if not the same) as the one on the chicken. It tastes so much better and wholesome. It is not too fatty like the regular fish fingers I used to eat before going organic/free-range/etc. I also love that they are sourced from Certified Sustainable Fisheries. It's so important to encourage people who are doing the right thing when it comes to farming. That's the other reason why I try to only eat organic/free-range/etc. They are priced the same as the Chicken Nuggets, so I usually only buy them when they are on sale (which is reasonably often). Like the Chicken Nuggets, I love these fillets because of the practicality. It's so easy to toss them in the oven and have a delicious meal, especially when I'm in a pinch and didn't have time to cook my usual protein (beans). Another reason why I love these (and Chicken Nuggets) is that they have no refined sugar in the breading. It's hard for me to buy even (supposedly) healthy frozen food, because a lot of them also have refined sugar in the ingredients list. I love these products and will continue buying them for as long as they are sold. I highly recommend them.